If you would like to be notified when this item is available, please click the button below. » FREE Velvet Bag Worth £12.00. 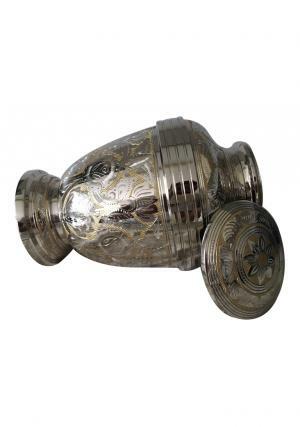 The Golden Royal Look Urn features a beautiful hand designed pattern engraved in nickel with a gold finish. The pattern recalls the designs of funerary pots and fabrics from the Indian subcontinent; and will create a gorgeous memorial to a loved one in the proper environment. 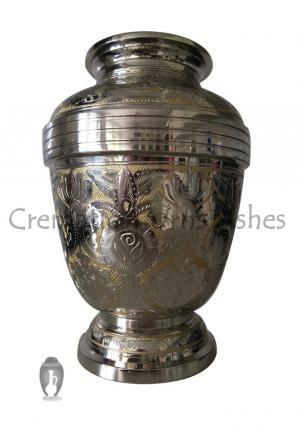 The Golden Royal Look Urn is hand cast from high quality polished brass, and includes a deep screw thread on lid and neck to ensure complete confidence while carrying and storing your loved one's ashes. 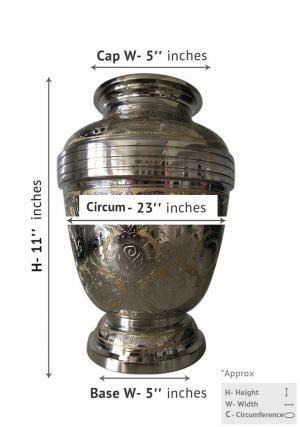 The urn stands Height:11", Diameter:23", Base-Width:5", Cap Width:5" (Approx) - making it slightly higher and wider than average. 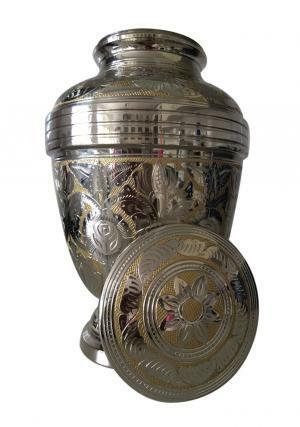 The urn is designed to take the full ashes of a cremated adult. All of our adult urns are delivered completely free of charge within the mainland UK. Purchases made outside the UK will be delivered according to current postage rates and times. Please contact our friendly and helpful customer services team by emailing cs@cremationurnsashes.com, or phone us on 020 37275556 for more information. 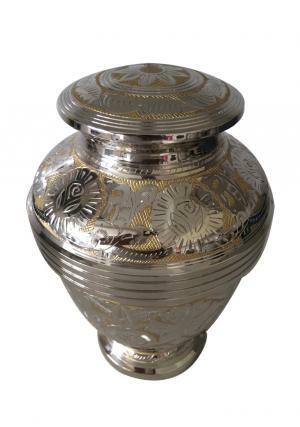 Our adult urns may also be personalised, and we also offer a bespoke urn creation service. Both personalisation and making to order command a small extra cost, and will extend the delivery time of your urn by between 2 and 5 business days. If you would like to discuss personalising your urn, please get in touch with us using the contact details noted above. We offer both online and phone ordering for your convenience. Our phone lines are completely secure - and we use PayPal to process secure online payments.